Title IV of HEA addresses federal financial assistance for students. Eligibility for Title IV aid determines viability and sustainability for most higher education programs. CBE programs eligible for Title IV aid must meet the criteria and guidelines specified in the HEA and in U.S. Department of Education regulations. In 2006, Congress included a provision in a reauthorization of the Higher Education Act to allow for direct assessment CBE, which allows competency-based programs to focus on meeting learning outcomes independently of the length of time that it takes students to complete those programs. This provision would have allowed Western Governors University (WGU) to separate the length of time that students spend learning from the learning that they accomplish. 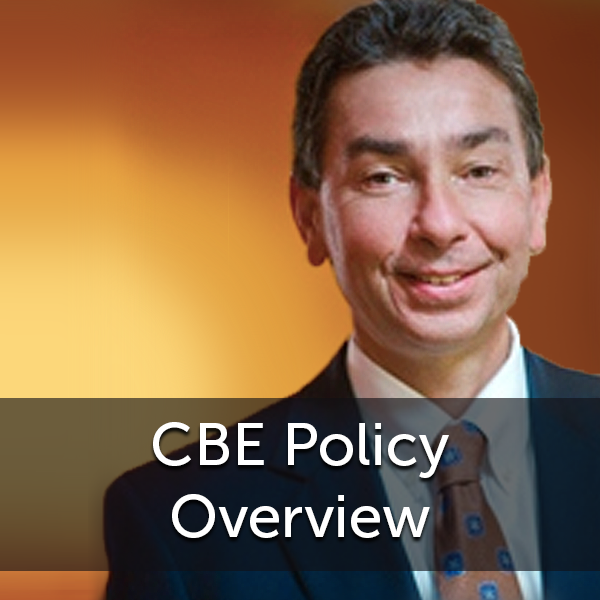 WGU leaders, however, chose not develop a direct assessment CBE program. Although allowable, there were no institutions that awarded Title IV aid on the basis of direct assessment until the 2013 launch of Southern New Hampshire University’s College for America, which was the first direct assessment CBE program in the country. Shortly thereafter, the University of Wisconsin System, Capella University, and Brandman University launched direct assessment programs. The University of Wisconsin System was the first public university to offer direct assessment. Competency-based programs must fit within this accreditation structure. 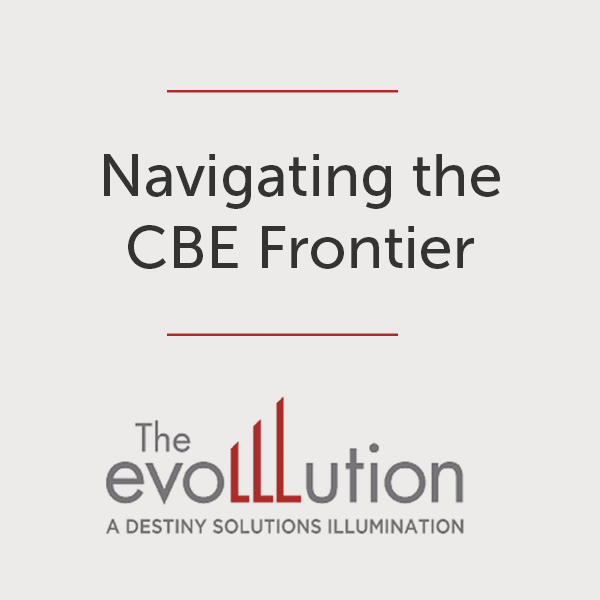 There are no specialty accreditors for CBE. 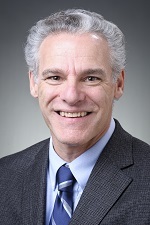 David Schejbal, dean of Continuing Education, Outreach and E-learning in UW-Extension, talks about the approval process for UW Flexible Option direct assessment competency-based programs. To award Title IV aid for most new programs, a regionally accredited institution must seek approval from its accreditor. Once approved, the program can be offered and students can receive federal financial aid. This is not the case for direct assessment CBE. Contrary to common practice, in addition to regional accreditor approval, each direct assessment CBE program at each institution has to undergo special review and approval by the U.S. Department of Education in order to be eligible for Title IV aid. This process typically adds six to nine months to the approval process for UW Flexible Option academic programs. In March 2013, the Department issued a “Dear Colleague” letter to provide guidance for institutions seeking approval to offer Title IV aid to students in direct assessment programs. In April 2013, the Department approved Southern New Hampshire University’s College for America for direct assessment. The UW Flexible Option responded to the Department’s July 2014 “Dear Colleague” letter and was among sites selected to explore regulatory flexibility for direct assessment CBE not based on the credit hour. UW System became the first public higher education system in the country to award Title IV aid to students enrolled in a direct assessment CBE program. Besides administering federal financial aid, the Department provides oversight of private accrediting agencies that evaluate the quality of postsecondary education in their regions, including the UW System’s regional accreditor, the Higher Learning Commission (HLC) of the North Central Association of Colleges and Schools, which piloted a CBE approval process with the UW Flexible Option in 2013. This approach included communications regarding existing policies, procedures and standards; UW Flexible Option compliance; waivers; and support for regulatory reform. This engagement continued at several levels. Institution/system: UW Flexible Option senior leaders convened academic policy planning meetings to ensure alignment with UW System internal policies impacting faculty, staff, and students as they developed UW Flexible Option policies. 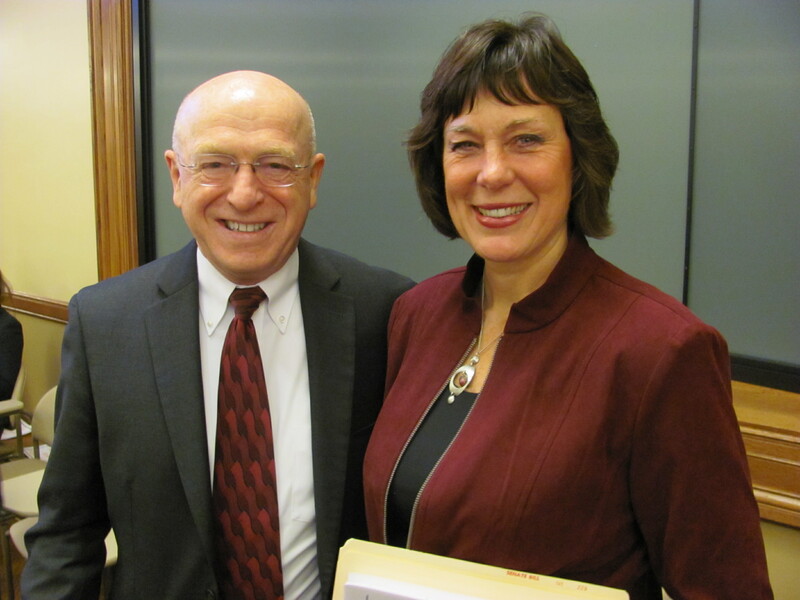 State Sen. Sheila Harsdorf received an update at a November 2013 UW Flexible Option legislative briefing led by Ray Cross, then UW Colleges and UW-Extension chancellor, who was named UW System president in 2014. State: In 2012, Wisconsin Gov. Scott Walker informed UW System leaders about the possibility of bringing Western Governors University into Wisconsin. They countered his plan with their own CBE program already in the planning stage. UW Flexible Option senior leaders continued to regularly update the governor and his office staff and also periodically brief legislative education committees and confer with other state regulators as appropriate. Regional: UW Flexible Option senior leaders informed the Higher Learning Commission (the regional accreditor for programs offered through University of Wisconsin System institutions) of plans to develop a direct assessment CBE program and worked closely with the Commission to get the UW Flexible Option up and running. UW Flex leaders continue to work with the Commission on accreditation and approval as new programs are introduced. National professional associations: UW Flexible Option institutional partners ensure that academic programs meet required standards, such as the University of Wisconsin-Milwaukee RN-to-BSN degree-completion program accredited by both the Higher Learning Commission and by the Commission on Collegiate Nursing Education. Federal: Innovation in higher education has been the focus of interactions between UW Flexible Option senior leaders and federal policymakers. Those interactions included conversations with officials in the U.S. Department of Education, members of Congress, and officials at the White House. UW Flex leaders continue to advocate for regulatory reform that allows innovations while protecting program quality and taxpayer funds. In addition to policy input with regulators and accreditors, UW Flexible Option senior leaders participated in policy discussions through higher education conferences, media, and other channels such as professional organizations. The University of Wisconsin was one of a small number of CBE providers that coalesced to found the Competency-Based Education Network (C-BEN), “a group of colleges and universities working together to address shared challenges to designing, developing and scaling competency-based degree programs.” Challenges include technology, pedagogy, and financial aid policy, for which C-BEN compiled federal financial aid compliance information for CBE providers in 2016. UW-Extension remains an institutional partner in C-BEN, and David Schejbal, dean of Continuing Education, Outreach and E-Learning in UW-Extension, served initially as co-chair of C-BEN and now as a C-BEN board member. 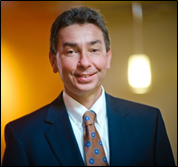 Schejbal also served as president of the University Professional & Continuing Education Association (UPCEA), which in 2016 suggested guiding principles for Congress to consider in the reauthorization of the Higher Education Act and referenced innovations such as CBE that benefit from regulatory flexibility. The relationship between regulators, policymakers, and higher education leaders is an extremely important one. In the end, their goals are the same: provide excellent education to diverse groups of students to support national economic and social goals. The challenges revolve around protecting taxpayer dollars from unscrupulous providers while supporting innovation in higher education. The University of Wisconsin is pleased to be part of this process and looks forward to continuing to engage in this very important, national conversation. The general media often describe competency-based education as a ‘shortcut’ to a degree. 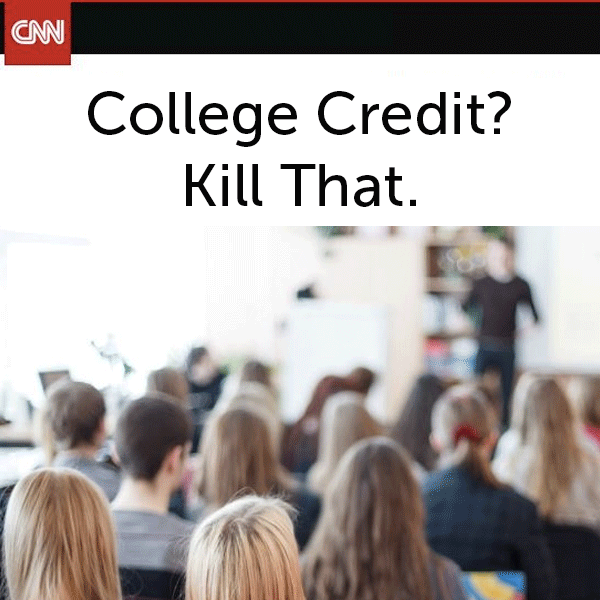 For example, The Atlantic titled its September 2015 article about Western Governors University ‘The Online College That Credits Life Experience.’ A recent survey by Public Agenda indicated that nearly 600 colleges are creating competency-based credentials. I worry somewhat that all these new programs may try to take shortcuts in program design, will shortchange students and sully the reputation of CBE. UW Flex senior leaders protect the University of Wisconsin reputation with the UW Flexible Option faculty-led structured curriculum including rigorous assessments and proactive student support. UW Flex senior leaders also seek to advance access to high-quality CBE by participating in organizations such as the Competency-Based Education Network. Furthermore, UW Flex leaders, through iterative approval processes and participation in the U.S. Department of Education Experimental Sites Initiative, seek regulatory reform to address challenges discussed below. UW Flex early response: UW Flexible Option senior leaders needed to devote more time and resources for the approval process than was required for traditional programs or for course/credit-based CBE programs (see takeaway above about how approval to award Title IV aid differs for direct assessment CBE). For a direct assessment program, they had to gain approval from the regional accreditor for each UW institutional partner offering UW Flex academic programs and then seek U.S. Department of Education approval for Title IV aid for each direct assessment academic degree program. UW Flex senior leaders sought to preserve the UW Flex pedagogical model while securing Department approval for Title IV aid. After months of negotiation without resolution, they chose to launch the Flex academic programs, continue working with the Department, and self-fund aid until later receiving Department approval. We were trying to fit the square peg into the round hole—trying to get Flex to look enough like a traditional program…We determined that this just wasn’t going to work, that the accumulation of changes we’d have to make to Flex would have changed it too significantly. UW Colleges received federal approval for financial aid in September 2014, followed by UW-Milwaukee approval in 2015. Looking forward from 2017: UW Flex senior leaders continue to highlight the need for regulations that ensure quality and allow for innovation. If we are going to have even a fighting chance to educate the number of citizens who need higher education, we need a new set of regulations that promote the type of high quality and flexible programs that the nation needs. The regulatory focus, first and foremost, should be on student success, student learning, and good learning outcomes. Are students learning in a program? Can they apply what they learn to the world around them? And is a program providing a coherent learning environment for students that fosters learning? These should be the foundations upon which regulations—and quality education—are built. The approval process also may be expedited as regional accreditors, including the Higher Learning Commission, gain more experience with direct assessment CBE models. 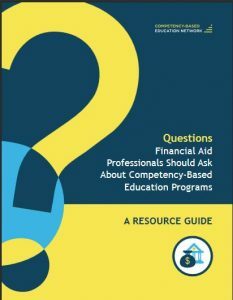 In addition, several frameworks exist related to quality of competency-based education programs, including a model based on the AAC&U LEAP design principles and outlined in “Designing quality into direct-assessment competency-based education” published by the Journal of Competency-Based Education in May 2017, Quality Principles and Standards for Competency-Based Programs released by the Competency-Based Education Network in May 2017, and the common framework for defining and approving CBE programs developed by the Council of Regional Accrediting Commissions in 2015. UW Flex early response: The U.S. Department of Education recognizes that some CBE models disaggregate or unbundle instructors’ roles. Such is the case for UW Flex, which separates the faculty role from the Academic Success Coach advising and support role. The Department allows for some stratification and role disaggregation in this education-and-support model, but also requires traditional “regular and substantive” interaction between faculty and students. That interaction must be initiated by faculty and is interpreted traditionally (see questions and answers 9 and 10 in the Department’s December 2014 “Dear Colleague” letter for details). When a student initiates contact with a faculty member, that doesn’t count as regular and substantive interaction. When an Academic Success Coach contacts a student, that doesn’t count as regular and substantive interaction—even if the coach has a master’s degree in counseling; even if the coach initiates weekly contact to monitor the student’s progress and need for additional resources such as faculty or tutoring; and even if the coach is guided by faculty. Looking forward from 2017: UW Flex continues to satisfy the “regular and substantive” interaction standard through individual faculty-led communications with students, through faculty-led goal setting activities, and through faculty developed and graded assignments. UW Flex leaders continue to support standards that would be appropriate for the educational model. We encourage the U.S. Department of Education to work with the regional accreditors to find new, more appropriate standards for evaluating direct assessment programs. The current standards focus on regular and substantive interaction between students and faculty, and that is a process much more appropriate for credit-based, term-based programs than it is for non-term, direct assessment CBE programs. Student status—as part-time or full-time—and student progress are measured by credits and impact financial aid eligibility. UW Flex provides an overview for students to explain how federal financial aid eligibility “floats” with students depending on how quickly or slowing they earn credit hour equivalencies. “Satisfactory academic progress” is required within the first 10 days a student starts a term. UW Flex requires students to complete a Goal Setting Assignment within the first 10 days of a subscription period. Six-year graduation rates are one measure of program quality. UW Flex senior leaders note that six-year graduation rates are not the ideal way to measure quality of a program geared for nontraditional students and providing the flexibility to start, pause, and resume programs to fit the lives of working adults, many of whom have families. In any case, UW Flex will not have significant data for this measure for several years. UW Flex has, however, piloted a survey for alumni and non-retained students to measure student satisfaction and program impacts. Looking forward from 2017: The UW Flexible Option continues to develop alternative metrics, including a definition of what it means to be “retained” as a student in a program designed to allow students to start and stop their education on their own schedules, as described in “Student success and retention using new definitions created for non-term, direct assessment CBE” in the Journal of Competency-Based Education. UW Flex also anticipates gleaning rich data from analysis of a 2017 pilot survey of Flex students who completed or were non-retained, and then will incorporate a post-Flex survey in the Student Engagement System alumni tool as an ongoing way to measure program impacts and student satisfaction. Information on alternative metrics also is posted in the Metrics section of the website. 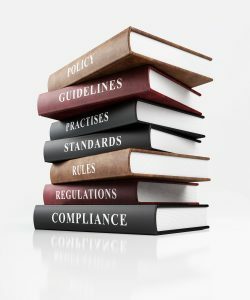 UW Flex early response: Colleagues who served as regulatory compliance officers at UW institutions (such as registrars, financial aid directors, and bursars) recognized that an innovative model like the UW Flexible Option did not easily fit into the existing regulatory framework. This mismatch raised concerns, for example, about how financial aid officers could ensure that Flex students would be able to use federal financial aid. At the time, few resources were available to shed light on the path forward. In time, even those who were most risk-averse shifted their focus to exploring how to satisfy existing regulations while maintaining the integrity of the educational model. Professional development and resources from external sources, such as the C-BEN checklist for financial aid officers, facilitated this process. The federal rules allow for competency-based programs. The C-BEN checklist will eliminate a lot of anxiety and allow financial aid officers to feel that these programs are doable. Looking forward from 2017: Compliance officers have witnessed UW Flexible Option academic programs’ successful navigation of the accreditor and federal regulators’ requirements. While they continue to assess risks, they are developing strategies to share with their UW colleagues who are new—or new to the UW Flexible Option. 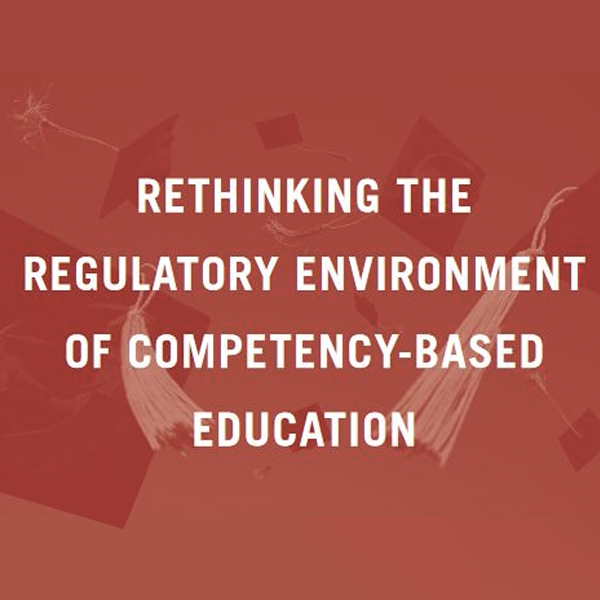 American Enterprise Institute report on "Rethinking the Regulatory Environment of Competency-Based Education"